While you're waiting around for the Gilbert Gottfried episode on the radio tonight, why not relive last week's chat with the lovely Katie-Ellen Humphries? She revealed lots about herself. We learned what it takes to be an overweight elite athlete, why her best friends in high school were on staff, and why she refuses to believe flirting directed her way might be for realsies. Listen here and now or download the episode at your favourite podcast depository. You know, your iTunes and the like. We're everywhere. You're in for a treat tonight. Well, if you tune in to CFRO 102.7 FM from 11 pm to midnight, that is. Our guest is the one and only Gilbert Gottfried. And it's a good one. I sat down with Gilbert inside an empty Yuk Yuk's Comedy Club one afternoon a few weeks ago when he was in town. I wasn't sure how it would go, since Gilbert is rather shy in real life. He barely said a word before I hit the record button, but as soon as I did out came the Gilbert we all know. We talked about the early days (he's been at it since the mid-1970s), his disastrous season on Saturday Night Live (he was on the cast that replaced the original Not Ready For Prime-Time Players in 1980), and the brouhaha over his joke Tweets about the tsunami in Japan a year ago. And quite a bit more than that. Like what? Well, like his time spent with Canadian Alan Thicke's foray into American late-night talk show TV. I posted this clip of tonight's show last week but in case you missed it, here it is again. And the full episode, as mentioned, runs tonight. If you're outside the Vancouver area, listen online at coopradio.org. In this episode of What's So Funny?, Ivan Decker reveals for the first time what his post secondary education consisted of, how Gleeful his high school career was, and his greatest fear. All this and more! Have a listen. Better yet, download the episode at your favourite podcast hub (mine is iTunes, but you do what you gotta do). On this Victoria Day weekend, What's So Funny? presents fellow Victoria native Miss Katie-Ellen Humphries. For some reason, it just sounds right to add the 'Miss'. Don't know why. Maybe because her Twitter handle is @MsKatieEllen, sure, but to me she'll always be a Miss, not a Ms. Miss Katie-Ellen recently got back from playing the Bridgetown Comedy Festival. Where's Bridgetown, you ask? Why, it's Portland, Oregon. Turns out there are a whopping eight bridges in Portland so they get the moniker, whereas Vancouver has a measly ... eight bridges. Hmm. Anyway, tonight will be Miss Katie-Ellen's first appearance on WSF? Exciting, no? It's a holiday tomorrow, so you can stay up late and listen. 11 pm, people. Carry on. Let's go for three video snippets in a row. What can I say? I was on a roll. The Ryan Beil episode from 2010 was one of my favourites so I thought I'd put together a preview for it. Here, Ryan talks about his famous A&W television commercials. The Gilbert Gottfried episode isn't airing for another 9 days, but it's been in the can for several weeks. I thought I'd give you a taste of what's to come with a video snippet. Here he is talking about his time spent on Thicke of the Night, starring Canada's darling, Alan Thicke. What's not to love about this episode? Standup comic/actor/scatologist Baron Vaughn joins us to talk about his Fame-like high school, thespianism, depression, Shakespeare, farts, Nostradamus, Darwin, not being accepted in the black community, and the inherent wrongness of the USA network shooting shows in Canada. Baron stars in one such series, Fairly Legal, which I hadn't watched before talking to him but have since seen an episode and it's really good. And I'm not just saying that so he'll come back on the show when it starts filming again next season. The show gets the coveted MacPherson Stamp of Approval™. As does Baron, who is as perfect a guest as can be. Enjoy. 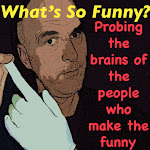 Click on the link below or go find What's So Funny? in iTunes or wherever fine podcasts are exchanged. While you're there, leave us a comment and a rating. We appreciate it. Happy Mother's Day, mothers. To commemorate this special day, our guest tonight will be Mama's Boy Ivan Decker. The Georgia Straight recently said Decker's "a real star in the making." Okay, that was me who wrote it, but I'm somebody and I believe it. I see Ivan all over town and never tire of watching him perform. That's a good sign right there. But checking back in our archives I notice that first and last time he guested on What's So Funny? was March 11, 2007! So he's overdue for a return visit. Tune in tonight at 11, CFRO 102.7 FM in Vancouver or livestream it at coopradio.org. If you forgot to get your mom something today, pull up a chair for her around your radio and let her listen with you. In this episode of What's So Funny?, I was joined by the Barry White of comedy, Darryl Lenox, as my co-host. The golden-throated one always took the role of mentor in the comedy community seriously when he lived here for 14 years. So on his weekend visit back to his old hometown, he decided to put his old friend, Paula Antil on the hotseat, questioning her comedy choices and challenging her to be the best she can be. Have a listen here or wherever it is you get podcasts. I know it's on iTunes, but it's also elsewhere. Ask for it by name. 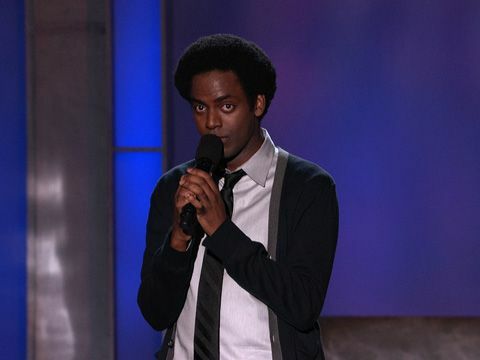 Tonight... finally... Baron Vaughn. This one's been in the can for several weeks now. Baron dropped by the What's So Funny? studios on his last full day in Vancouver and gave a clinic on how to be an outstanding guest. The star of USA network's Fairly Legal is naturally funny throughout but also managed to speak with substance and open up. He talked about his Vancouver-induced bouts of depression, his love of Shakespeare and farts, and not being accepted in the black community. Tune in. You won't be disappointed. Or bored. And, really, isn't that what it's all about? Tonight at 11 pm PST on CFRO, 102.7 FM, in Vancouver or livestream at coopradio.org.